A one-dimensional function has a gradient which is defined as the slope of the tangent to the curve at . We wish to extend this idea to cover scalar fields in two and three dimensions. where is the angle shown in Figure A.19. 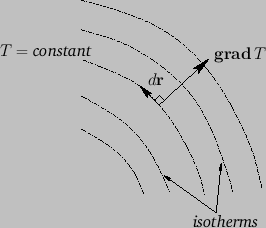 Let us define a two-dimensional vector, , called the gradient of , whose magnitude is , and whose direction is the direction of steepest ascent. The variation exhibited in the previous expression ensures that the component of in any direction is equal to for that direction. 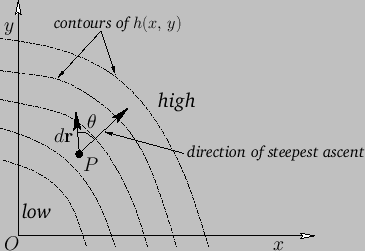 Figure A.19: A two-dimensional gradient. Incidentally, the previous equation demonstrates that is a proper vector, because the left-hand side is a scalar, and, according to the properties of the dot product, the right-hand side is also a scalar provided that and are both proper vectors ( is an obvious vector, because it is directly derived from displacements). This integral is clearly independent of the path taken between and , so must be path independent. where corresponds to the line integral around a closed loop. The fact that zero net work is done in going around a closed loop is equivalent to the conservation of energy (which is why conservative fields are called ``conservative''). A good example of a non-conservative field is the force field due to friction. Clearly, a frictional system loses energy in going around a closed cycle, so .